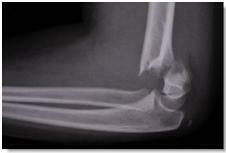 With thanks to Dr Jess Spedding for the continuation of her minor injuries series…. appear should always be C,R,I,T,O,L. 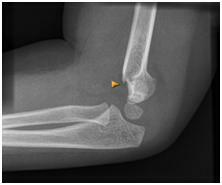 For example in a 6 year old you would not expect the lateral condyle to have appeared yet, so if there is a bony fragment at that site, it is suggestive of a fracture. neurovascular structures and will not provide the stability required for neatly aligned healing, so a trip to theatre for fixation will happen soon after. 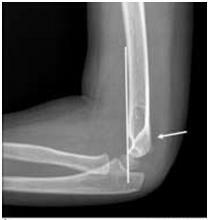 Type 1 can usually be managed conservatively with an above elbow cast and sling, whilst 2 and 3 require operative fixation. gradually do away with the sling, to allow mobilisation without too much discomfort. A rare but debilitating late complication of supracondylar fractures is Volkmann’s ischaemic contracture (when the brachial artery is damaged and months later the patient develops clawing of the thumb and fingers and forearm wasting). …are here! A bit on TB for your interest, pain scoring tools and links to growth charts. Also some pointers towards useful e-learning tools. Do leave comments below. We currently use 2 recognised pain scores in our Emergency Department, depending on the age of the patient. The FLACC score (ref) was put together at the end of the 1990’s and has been validated for use in pre-verbal children aged 2 months to 7 years. The Wong Baker (“smiley faces”) score is for use in the over 3’s. We also ask older children to give us a mark out of 10 on their pain with 10 being the worst they have ever felt and 1 being not too bad. Our local pain protocol suggests what the health professional should do with the information gleaned and when the child should be reassessed. I have reproduced that table for you here. The UK Department of Health National Service Framework for young people and maternity services says that the prevention, assessment and control of pain in children should be subject to regular audit. This is a systematic review of RCTs looking at the analgesic efficacy of oral sweet solutions compared to water or no treatment in infants (1-12 months) during immunisation. There is already a large body of evidence that sucrose or glucose reduces the pain of venepuncture in newborns and the authors conclude that it also works in the older infants though the effects are more moderate. They suggest that healthcare professionals should consider using sucrose or glucose before and during immunisation.